Riding Holidays in Wales - Explore the rural countryside, beautiful Cambrian Mountains, local pubs, castles and farms. Enjoy riding strong Welsh Cobs through the countryside, mountains and to a local pub in Wales at this family owned riding center, which has been family owned and run since 1968. This small, British Horse Society approved equestrian center specializes in adult riding holidays. Its location on the edge of the beautiful Cambrian Mountains in the heart of rural Wales allows for spectacular rides and varied wildlife. Old Roman roads and ancient drovers tracks take riders past clear mountain streams as they bubble down wild, natural hills into shady valleys. You may have seen this riding holiday on Equitrekking on PBS, Horse & Country TV or one of the other international TV networks that broadcasts our Emmy-winning TV series. We filmed the ride for Equitrekking and the scenery is beautiful! This weeklong adventure takes riders on daily rides into the countryside. In this part of Wales, you may also want to visit Carreg Cennen, one of the most photographed castles in Wales, old Roman Gold Mines, a Welsh Cob Stud Farm and more. Your hosts will invite you to learn more about Wales and talk about your day riding, as they eat with you in the evenings in their family home, which they open to guests. You’ll stay in Lesley’s late Victorian farmhouse or the new block of accommodations. Lesley works hard running the house and kitchen, and once in a while also leads rides. She loves to cook and enjoys producing the sort of homemade cakes and meals few people have time to prepare for themselves these days. The rides are run in a very relaxed manner. On day rides, you’ll cover a good bit of ground and enjoy lunch on the trails. One day, you’ll even ride to the local pub! There is a fully qualified leader and an assistant on rides who are there to help and encourage you throughout. The main leaders are Roddy and Charlie (Lesley's dad), who you may meet in the corresponding video (click video above). They also have three other fully qualified leaders. The owners encourage everyone to be part of the family. We filmed at this British Horse Society approved riding center in Wales for the Equitrekking Wales episode for PBS. Featured on Equitrekking Wales episode, part of Equitrekking fourth season on Public Television. Approximately 26 Welsh Cobs and Welsh Cob Crosses that are friendly and forward going. The riding center has a rotation system for the horses whereby they work no more than three consecutive days at a time. Everyday the horses come in to be brushed off and checked and fed when appropriate, whether they are being ridden or not. During the period that the stables are closed, the horses have all of their shoes taken off and are sent to graze near the coast for a holiday. Stay in a late Victorian farmhouse with ensuite shower rooms and tea/coffee making facilities in every bedroom for your riding holidays in Wales. All the rooms are equipped with a hairdryer and a radio alarm clock. An iron is available. There is also a bathroom with an abundance of hot water to soak away any aches and pains. Alternatively you may fancy an aromatherapy massage, which this outfitter can arrange for you. The farmhouse features a communal dining room, comfy living room with Sky TV, magazines and games and a bookcase with reading material. There is a game room with a pool table and table tennis table and a small shop selling riding wear and local crafts and produce. Wireless internet connection throughout the farmhouse. There is a small garden at the front of the house. A full English breakfast, a packed lunch, afternoon tea and a two course evening meal is included in your stay. Breakfast is a choice of different types of eggs, cereals, bacon, sausages, fried potatoes, tomatoes, mushrooms, baked beans, fried bread, toast, sausages, orange juice and a variety of teas and coffee. A packed lunch consists of a round of sandwiches with different fillings, chips, an apple, a chocolate dessert and a carton of juice. Afternoon tea consists of two different treats each day, most of which is homemade, for example scones and cake or toasted tea cakes and cookies or toasted crumpets and cake. Dinner consists of a main course of meat with two vegetables and potatoes all freshly prepared, as well as dessert. The main course might by Steak and Ale pie, Roast lamb, Cottage pie, Chicken in a mango sauce, Pork chops in a sweet and sour sauce, etc. Desserts may include lemon meringue pie, pineapple upside down cake, apple pie, kiwi and orange sponge, bread and butter pudding and more. With prior notice, the owners accommodates vegetarians and other special requests. Alcohol is not included in the price for these horse riding holidays UK but clients are welcome to bring their own and there is a fridge for cooling anything. Hot and cold drinks are available throughout the day. This vacation is popular with single travelers, couples and small groups of friends. Travelers should be fit enough for a few hours each day in the saddle and excited to see the peaceful Welsh countryside. Choose the Standard Week, Six Day Special or Midweek Break or ask us about more flexible stays with these special Wales Riding Holiday options. Standard Week: Arrive Saturday in time for dinner. 5 days riding, leave Saturday morning after breakfast. 5 days riding arriving Sunday in time for dinner, leaving Friday after afternoon tea. * Price subject to changes based on currency conversions and include VAT. Prices are based on sharing a room with one other person if need be OR a single room supplement has to be added. 4 - 5 hours of riding per day plus full board accommodation. International flights, tips, transfers and alcoholic beverages. Non riding partner/friends welcome! There is great area sightseeing, mountain biking and more. 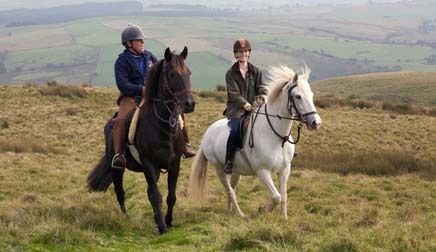 Located near the pretty mountains in rural West Wales, this vacation features amazing trail riding country. Horse ride along old Roman roads and ancient drover tracks, past clear mountain streams bubbling down wild hills into shady valleys. You'll ride a forward going, well cared-for Welsh cobs or other breed. There are horses suitable for all levels. You'll spend around 4 to 5 hours in the saddle each day, so will need to be able to walk, trot and canter prior to arrival. This makes the riding holiday more enjoyable and a lot less painful! Fun and relaxation are the main aims. Want to stay in bed until breakfast? No problem. Your horse will be brushed and tacked up ready for you. Alternatively, get up earlier and prepare your horse yourself. You will be supervised at all times. This is an excellent opportunity to gain confidence. Horseback rides may include the Pub Ride, where you ride to a small village for lunch at the pub and after trek through the edge of the historic Roman Gold mines and then head towards home along a lower part of the Cothi Valley. Another day you may ride into the mountains along old drovers tracks to see that quintessential patchwork countryside and perhaps an old burial mound. It's all part of the adventure of riding in Wales! There's no way that we can put into words to say what a GREAT & ENJOYABLE time we had with all of you. Thank you very much for your hospitality and giving us the opportunity to ride such fantastic horses in such amazing countryside. We will be back! Just wanted to thank you from us all for just the most perfect weekend - the fact that we are all hobbling about today has nothing to do with you but more the fact that we are all rather unfit! I would like to congratulate you on a most professional business that is balanced to offer a happy relaxed family environment whilst still maintaining the tight structure required to run effectively. The wonderfully steady and kind horses are a reflection of a caring attitude that pervades the farm and everyone involved in the business. Thank you once again for the brilliantly refreshing and fun time that we had. When life is getting you down, there ia nothing better than to be with horses,amongst great people and with wine in your hand by 6pm!!! Thanks to everyone for making our stay so very special. The Rough Guide to Wales is the ultimate travel guide with clear maps and detailed coverage of all the best attractions in Wales. Discover the vibrant regions of Wales from the world-famous Valleys and Welsh male voice choirs to the trendy bars of Cardiff Bay. With the clearest maps of Wales and useful Welsh language section, this Rough Guide will take you to the very best attractions Wales has to offer. The Derwen name is synonymous with outstanding Welsh cobs - not least those famous winners of the Prince of Wales Cup. On thirteen momentous occasions, the Prince of Wales Cup was awarded to the outstanding horses featured in this book, and the owners are rightly proud of this unbeaten record. Photographs, pedigree information and comments from eminent breeders and horselovers make this a book to treasure. * You’ll be visiting this stud farm and their small museum as part of your tour and if you are lucky Ifor or Myfanwy will be there to meet you. This book is in English and Welsh. Look for it on this link to Amazon. It's not always available, and if you can’t get it in the U.S., you may be able to get a copy in Wales. Booklist Review-- Davies, a teacher in Cardiff, has not only taken cognizance of, and fluidly applied, the new tools history avails itself of--such as economics and archaeology--he first wrote his history in Welsh. His tremendous exertion was something new that the readers of Wales recognized, and they made it a best-seller there. Davies unearths the evidence of prehistoric hill forts and Roman ruins; he delineates the feudal wars, the 1536 union with England and the ensuing Reformation; and he explains the transformations of the Industrial Revolution. Accurate in all details, using meaningful modern maps, balanced where doubts exist, this impressive history could be criticized as a labor of patriotic love, if not for the visibly high professional standard to which Davies adheres. Nothing even remotely as accomplished has been written about Wales since 1950. And, for a few future decades, don't expect a vessel this sturdy to pass by. Thousands of people visit Wales each year and countless people all over the world are descendants, at least in part, from this small, beautiful part of the British Isles. Yet how many know the history that has made Wales and the Welsh people what they are today? Here is a clear, objective treatment by an American professor of history who has been keenly interested in Wales for many years. The book traces the key forces and developments through all the centuries of the country's history. Although Welsh history is complex and the strong nationalism it has generated among some Welsh people causes controversy, this book presents a balanced, unbiased account. Also includes history on the diverse nature of contemporary Wales. Novice to advanced. Everyone must be able to walk, trot and ride short canters. 4 to 5 hours per day depending on the ride and other scheduled activities. Cardiff (2 hours). Heathrow or Gatwick and then take a train to the riding center. Travelers may get to the riding center from the airports using public transportation. Your host is happy to pick you up from their local towns of Llandovery or Lampeter at no extra cost. Trains run to Llandovery and coaches run to Lampeter. There is a charge for pick-ups further away. Vacations run year-round, but the best time to visit is early May to late September. Spring is beautiful with everything coming to life and autumn is equally beautiful with all the changing colors.